I often talk about the use of cell based structures (e.g. think Amazon Two Pizza, Starfish model) which are populated not only with aptitude (the skill to do something) but the right attitude (type of people). A map is an essential part of building such a structure (see figure 1). 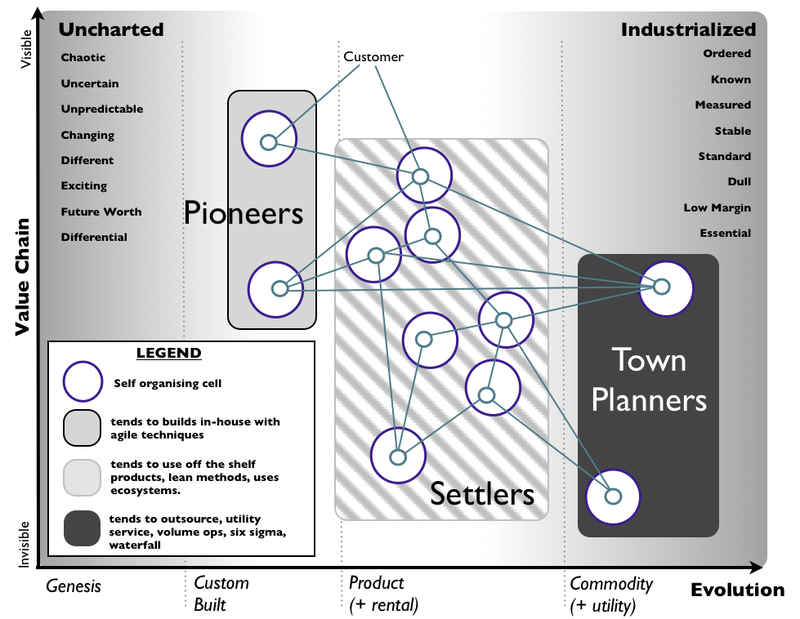 Figure 1 - Pioneers, Settlers and Town Planners. The concept of Pioneers, Settlers and Town Planners is a derivative of Robert X. Cringely's description of companies as Commandos, Infantry and Police as expressed in the delightful 1993 book - Accidental Empires. The first time I used this structure was around 2005-2006. Settlers are brilliant people. They can turn the half baked thing into something useful for a larger audience. They build trust. They build understanding. They make the possible future actually happen. They turn the prototype into a product, make it manufacturable, listen to customers and turn it profitable. Their innovation is what we tend to think of as applied research and differentiation. They built the first ever computer products (e.g. IBM 650 and onwards), the first generators (Hippolyte Pixii, Siemens Generators). Town Planners are brilliant people. They are able to take something and industrialise it taking advantage of economies of scale. This requires immense skill. You trust what they build. They find ways to make things faster, better, smaller, more efficient, more economic and good enough. They build the services that pioneers build upon. Their type of innovation is industrial research. They take something that exists and turn it into a commodity or a utility (e.g. with Electricity, then Edison, Tesla and Westinghouse). They are the industrial giants we depend upon. What you want is brilliant people in each of these roles. How do you get things going within a company? Determine (by mapping) an activity that is currently expressed as a product but is ready for industrialisation to a commodity and even better a utility service. It needs to be suitable, widespread and well defined enough, the underlying technology should exist and there should be a frustration in the market with the current provision. Now, find some town planners to build the more industrialised form for you (remember they are brilliant, smart and won't be cheap). The pioneers create the entirely novel and new (genesis) by consuming (building on top of) those industrialised components (it reduces cost of failure, increases speed etc). Ideally the pioneers are not just within your company, but more favourably contain outside companies building on top of your component. Hence, it's a really good idea to expose your newly industrialised form via a public API. The more pioneers there are (both inside and outside) the bigger the ecosystem around your component is. This will not only give you greater economies of scale but you can mine the ecosystem to identify future success (it operates as a future sensing engine). If you don't know how, read up on the ILC model here. Often what the pioneers produce is something just beyond a prototype (more towards a MVP). Often it has bugs or some other failings but it is useful. Within a company, you can incentivise internal pioneers on the creation of new things that are eventually turned into new products & services by use of an internal royalty. Now, you need some Settlers (custom to product and rental services). The job of the settlers is to identify common patterns in the ecosystem (whether just internal pioneers or internal & external). This can be done by leveraging consumption data of the underlying components or simply inspecting a range of new activities for common elements or simply taking something an internal pioneer developed. Once a pattern or activity is identified, the job of the settlers is to turn it into some sort of product i.e. they steal from pioneers and productise it (make it manufacturable, documented, profitable, stable etc). You can incentivise settlers by product profitability and by which products make it to utility services. A key role of the settlers is to steal from the pioneers who are in effect acting as the settlers R&D centre. Sometimes an internal project is going nowhere and the settlers will steal it, replace with something from the outside market. There is a problem here in that settlers can sometimes want to keep something going for too long. Also if you're using an ecosystem to identify future success then remember, you're are the gardener of that ecosystem. If you harvest too much, it'll die off. So think carefully - you need to harvest and nurture. The job of the town planner is to build the core, volume operations based, good enough, ultimately (long term) low margin but highly industrialised services & commodity components. They use the portfolio of the settlers, any consumption data, comparison to outside to determine whether something is suitable. Once identified they build the core service and inform the other groups (e.g. you tell pioneers so they have something to build upon, settlers so they know that this part of the portfolio is being industrialised). You incentivise town planners on volume and breadth of service offerings. You actively encourage them to cannibalise your own business as fast as possible. By creating this virtuous cycle which is incentivised so that each group steals the work of the former - town planners stealing from settlers who steal from pioneers who build on the work of town planners - you can accelerate innovation, customer focus and efficiency all at the same time and remove the threat of inertia to change. Each group innovates but innovation is not the same for each group i.e. the innovation of an entirely new activity is different to the feature differentiation of a product which is different from converting a product to a utility service. Unfortunately, despite being different forms of innovation that won't stop people pretending there's only one and it's all the same. Try not to do this. Each group has different attitudes though aptitudes (e.g. broad skill description such as finance, engineering or marketing) might be the same. Engineering in the pioneering group is not the same as engineering in the town planners. Each group has a different culture. I hear endless stuff about company culture. Go ask special forces, infantry and police whether they have the same culture or not. Pioneers don't disrupt. There is nothing to disrupt. There are two forms of disruption (predictable and non predictable) but that doesn't stop people pretending there is one. Whilst building two party systems e.g. pioneers and town planners usually cause huge headaches, there is one exception. Then in these exceptional circumstances you can build a settler and town planner structure by outsourcing your pioneering capability to the outside world. You're really still three party but you've outsourced one part. Whilst one party systems e.g. one size fits all usually cause huge headaches, there is one exception. Then in these exceptional circumstances you can build a settler structure by outsourcing your pioneering capability to the outside world along with the component supply chain. In this type of structure you purely manage and exploit the flow from the uncharted to industrialised. You're still really a three party structure just you've outsourced two of the parts. Only now I am a bit of a fan of this map... Still wondering though why you put "Theft" in the title. Seems to have been forgotten in the content of the article?